Ever since its establishment in 2014, the Casino has managed to grow and expand. 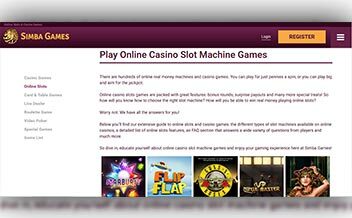 The Casino has continued to improve the player’s experience through its gaming developers SkillOnNet and Williams Interactive. The Casino allows players to partake in thrilling games and is licensed and regulated by the Malta Gaming Authority. With an amazing selection of thrilling games ranging from jackpots, table games, live poker, and live Casino games, Simba Games Casino is among the top online Casinos. This ensures that a players’ thirst is quenched when it comes to online Casino games. The top developers of the Casino offer high-quality games to players guaranteeing total enjoyment. 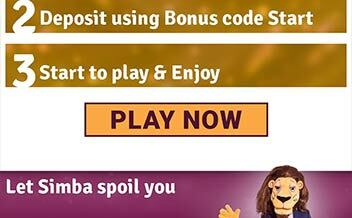 Simba Games Casino offers several progressive jackpot games for its players. All a player needs are a stake and a bit of luck to get the multi-millions offered. Progressive jackpot games offered by the Casino include Hall of Gods, 24 Mulle, Indian jones, Starfleet captain and many more. There are over 100 popular slots which players can enjoy. Some of the popular slot games include Zeus 3, Lunaris, Montezuma, Abra Cadabra, 300 Shields, SkillOnNet. Other slots include Aloha, Guns n Roses, drive multiplier mayhem, piggy riches, tornado farm escape, Dracula, and others. The Casino offers its customers an unmatched experience in their table games section. Players get to select between over 19 table games available. Some of the games provided include popular roulette and card games such as Punto Banco, Craps, French Roulette, Blackjack Turbo and American roulette. 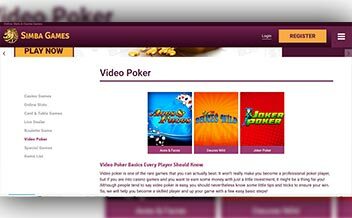 Simba Games Casino offers over 16 video poker games. Players get to enjoy a good selection of video poker games such as Aces and Faces, Joker Poker and deuces wild. Others are Roll a Ball, Double Heaven, Scratch cards and The Big Wheel. The Casino’s live Casino features a selection of quality and thrilling games for players to partake in Players can comfortably play with croupiers that are extremely helpful, making the whole experience awesome. Some of the Live Casino games include a good selection of Roulette, blackjack and baccarat games. Upon registering and a minimum deposit of £20 and a maximum deposit of £100, players get a 100% deposit. The wagering requirement is set at 30×. All new players signing up are provided with 20 free-spins with no wagering requirements. But bonus code or no deposit bonuses are not available. The VIP club is a 6-level-club with which players start with bronze, as they progress to silver, gold, platinum then diamond and finally red diamond level. One is able to climb the levels by gaining comp points. VIP treatment includes account managers, an invitation to exclusive events, offers and other prizes. Sorry, but we don't have software matching this criteria. 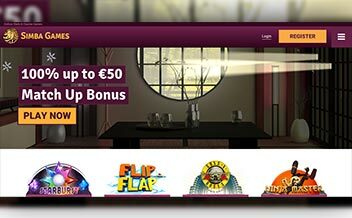 Simba Games Casino keeps login players on their toes by providing them with new games, slots, and promotions regularly. As a frequent or interested gamer, you need to visit the site from time to time for you to be up to date with the latest information. You will not only get the excitement you need but also gain points and also stand a chance to win prizes. It is due to this purpose that the section has been set aside. Simba Games Casino has collaborated with the best developers in the gaming industry to provide players with a hoard of thrilling games that are worth the time. The Casino is powered by Williams interactive, Next Gen gaming, Bacrest, green valley games and Amaya. The Casino can be accessed by use of mobile devices and personal computers. With these mentioned devices, an up to date operating system or browser is required. The main browsers to enable you to get content provided by the Casino include safari, opera, Google Chrome, Mozilla Firefox, and others. The theme used is the fairytale with attractive pink and black colors. The main menu makes everything easy by only clicking on it. This makes navigation easy at any time. 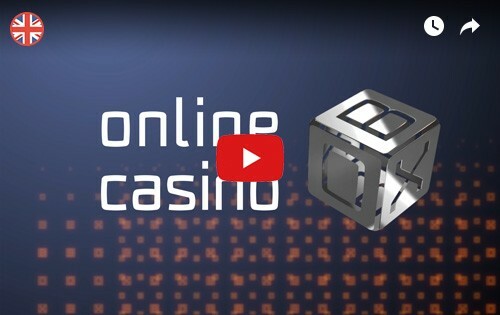 Interested players can access the Casino and play multiple of games using their personal computers. Punters get to enjoy games provided by the Casino by using their mobile devices. Game available include Green Lantern, Batman, Lady Luck and Bobby 7’s. The Casino uses 128-bit security encryption that ensures players’ critical details are safely secured at all times. iTech labs certify games using a random number generator. This ensures fairness. Players can, therefore, be rest assured of safety anytime they log in to play games. The Casino is regulated by Great Britain gambling commission and MALTA Gaming authority that listen to complaints made by clients. Samba Games Casino uses a good number of options to provide the required support for players at all times. This ensures that all concerns are taken care of avoiding any disappointments. A live chat is available enabling gamers to chat with the support group for quick help. International telephone numbers are provided on the website for players with problems to call the Casino. You can also choose to write an email and wait for a transparent response regarding the matter. There are a number of email addresses provided at the site following problem faced. Samba Games Casino has a remarkable choice of games they offer to players. The welcome bonuses, spins and the VIP scheme has enabled the Casino to gain more players to benefit from the treatment. Gaining comp points which can be redeemed or enable one to climb rank on the VIP program is a bright idea as players would want to accumulate more and more. The wide range of deposit and withdrawal options make it easy for players.